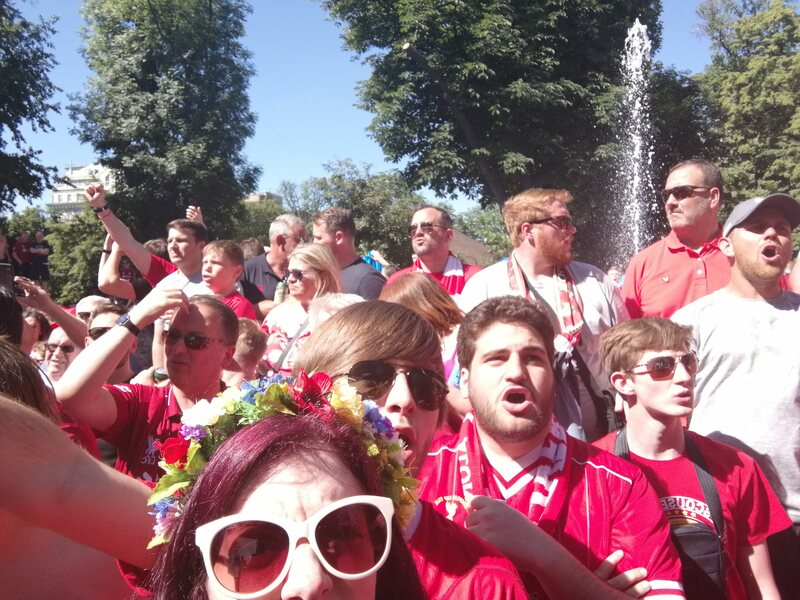 Ten days ago, I was in Kyiv to watch Liverpool play in the Champions League final, along with thousands of other supporters from Liverpool and around the world. You’ll inevitably have heard what happened in the game itself, but I hope you’ve also heard about why pretty much everyone who was there is talking about it as one of the best football days they’ve ever had. 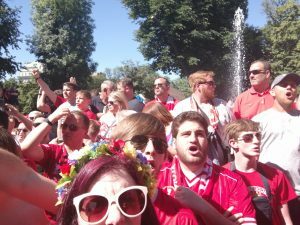 Shevchenko Park in the afternoon was a special, special place, home to a rare feeling of people coming together in genuine excitement and belief. I love art, but this feeling is not something which usually comes with the package. There are shows you’ve seen that other people have seen that you get together to talk about, but rarely do things come along which feel communal in this same way of making people feel united with a sense of commitment and belief. Art is more often about the individual, rather than collective, experience. I was thinking about this because I realised that the dates of my trip meant that I completely missed the Museum of the Moon – Luke Jerram’s installation at Liverpool Cathedral. The main way I realised I missed Museum of the Moon is because it seems that almost everybody I know in Liverpool went. I couldn’t log into Instagram without seeing the Moon from below – the Moon from the side – the Moon on your hand – the Moon in between your fingers. From a distance, watching people’s photos, likes and comments, it seemed that The Moon (capitalised to distinguish it from, you know, the actual moon) became something akin to a collective experience. They estimate that 60,000 visited The Museum of the Moon in a week. 16,000 people on the final day alone. Of the set above, picture 1 is the one which certainly seems to speak of the Museum of the Moon becoming, at least for one day, something of a phenomenon. When was the last time we saw queues like that in Liverpool wanting to access art? Probably 2014, when The Giants last paid us a visit. Apparently there were a million people out on the streets during that visit. Unsurprising, then, that they’re coming back in October. 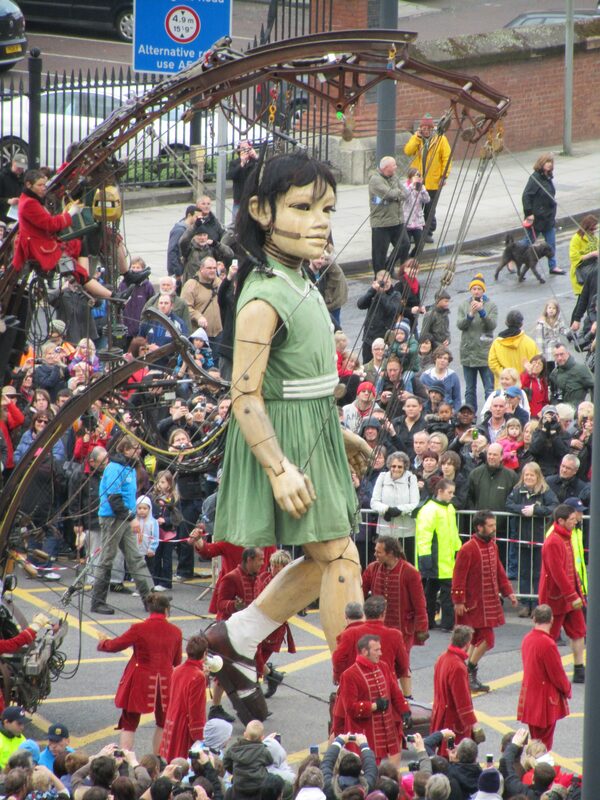 There are valid reasons to be wary of these kinds of large-scale, one-off art events that Liverpool Council seem so fond of. They fit neatly under the banner of “cultural tourism”, a phrase I’ve heard with increasing regularity lately and one which on paper sounds like a win-win concept – using culture to bring in visitors. Undoubtedly, it’s a strategy that’s brought Liverpool a lot of benefits in the last decade. But a local government strategy based entirely on big-ticket events invokes the spectre of cultural whitewashing – a cover behind which decisions are being made which don’t necessarily meet the needs of the creative innovators of the city. Funding cuts are one major issue of course, and money being spent on these landmark, but irregular, cultural events is money not being spread amongst the grassroots projects and artists who actually constitute the kind of thriving cultural community the council wants to market. This then feeds into the perception that these events act as a kind of “cultural box-ticking”, after which other ventures can be sacrificed for a more conventional kind of ‘progress’. This is what we saw it the loss of the Wolstenholme Square spaces like the Kazimier, Cream and WCS. Now the threat looms over the potential of the Ten Streets before a single new brick has been placed. And yet these big festival events might be the closest art can get to the kind of positive communal experience I started this post by talking about, and this matters. We live in a time when funding always needs to be justified, when putting in the miles to engage people in art is perhaps more important than ever. Staging events which attract a million people isn’t a panacea, but they do give audiences who perhaps aren’t regular gallery visitors the space to feel enthused by art. Who knows, perhaps these events will act as a jumping off point for wider cultural exploration. There’s no doubt that a gap exists between the experiences of most local artists and the support for these banner projects. Should it not be, though, that these two worlds complement each other? That the experience of the major street events encourages support for the ventures of galleries and independent organisations around the city? If art is ever to come close to a city-wide shared experience, these have to be two sides of the same coin. Open Culture CIC do a good job of this with Light Night and the Arts Markets, but it’s local government who have the real power to take this further. The visit of the Giants in October is well and truly billed as their last: wouldn’t it be nice if they invested some of that money into linking local culture infrastructure more into what they do? Then we’d all be singing. This entry was posted in Home, Let's Talk About It and tagged art, culture, Liverpool. Bookmark the permalink.